I was completely fine with the manufactured limoncello, the Italian lemon liquer, that are now easily available at BevMo...until Justin and Olaina came back from Rome with a small bottle of the real stuff. I have been in search for a palatable manufactured one since then. And I have not found one that even comes close to the little bottle Italy-shaped bottle from Rome. 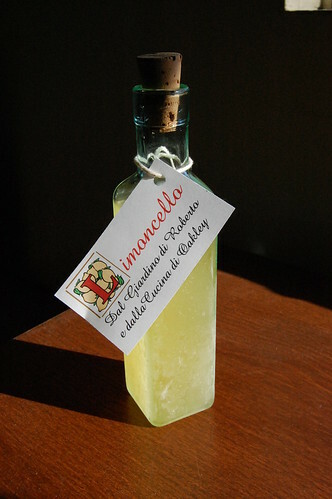 While I researched for those, I found that limoncello could be made at home, and found a recipe. One bottle (750 ml) Everclear 151 proof. Peels from 20-25 lemons--organic and/or wax-free preferred. Simple syrup made with 4 cups sugar and 4 cups of water. 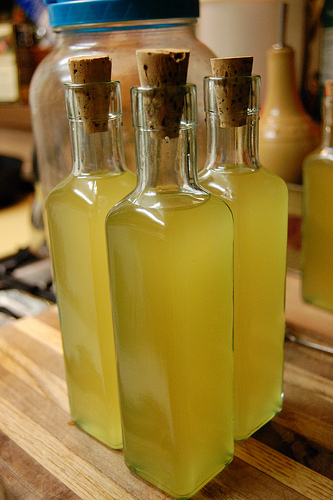 Recently, I've been making limoncello with a bottle of Grappa Piave (about $27 for one liter--best value! 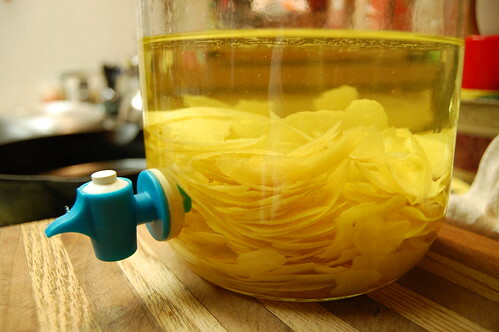 ), 12-15 lemons, and simple syrup made with 2 cups each of water and sugar. The method is exactly the same. More flavorful, a little smoother, but still pack a good punch. Hell, yes! I made the Strawberry-infused sake already. This should be cake walk. 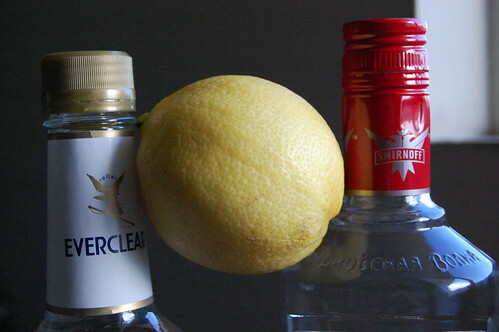 You soak pith-free peels of 20-25 lemons, preferably organic and/or wax-free, in a bottle of Everclear and a bottle of regular Smirnoff vodka for 2-4 weeks in a cool, dark place. Drain and add simple syrup. Stick it in the fridge for another week. And ecco! There's your limoncello. Yes, dear. I did say Everclear. The 151-proof one aka the only kind legally available in California. Everclear to get the flavors out. Good vodka to round out the edges. I found some other recipes that use 2 90-proof Smirnoff instead. But I think Everclear probably does a better job of flavor extraction. But then, there were a few hurdles. The first hurdle, finding organic, wax-free lemons. I'm sure I probably could pick up those at Whole Foods or something, but I'd prefer someone's backyard lemons. So I bartered with my coworker Rob: a bottle of limoncello for 20+ lemons. The second hurdle, peeling them lemons. Okay. Call me paranoid. From what I read up, a wee little bit of white pith could turn the batch bitter. So, I painstakingly, may be even unnecessarily, scrape each and single piece of lemon peel I carved off the lemons. It took at least 2 hours. I set up a little station in front of the TV with a bag of lemon, a glass jar, a garbage bowl, a peeler, and a small paring knife and put in a DVD. And to town I went on the lemons. You just have to plan it out, you know. Obviously, you can make it today and have the stuff tomorrow. My first batch was done in the fall. The second batch is now wrapping up in the fridge, waiting to be bottled for Christmas. You can use all sorts of other bottles for this too. Paul gave me an empty scotch bottle with a cork-top which is totally awesome. And here I am, downing a New Zealand sparkling mineral water for the bottle for Shane. The effort and patience to make this was definitely huge. But trust me. It's soooo worth it! It tastes fabulous and make fantastic gifts. Lovely! Must remember to do this for next Christmas!